Denny Jump (Bellevue, WA, United States) on 13 October 2010 in Landscape & Rural. This is a wider view of the huge mammoth rock we saw a few days ago . The Hidden Valley area is so full of different types of vegetation, it almost looks "busy" but I wanted to give you the full picture of this particular zone. Also, I neglected to mention to you that the shorter plants that have the long sword-like "leaves" are Yucca plants and they are related to the Joshua tree as well. During bloom time, their blossoms are almost identical to the Joshua Tree's blooms. Now, tomorrow, although we will still be within the boundaries of the National Park, I will take you about 25 miles to the east of this site so you can visit the Cholla Cactus Garden..an amazing place to visit. You really seem to have captured a small part of paradise here. Must really be quite magical to be right in front of this spectacle. @Phil D. Morris: Hi Phil..Thank you so much. This place is magical for those who have an open mind and heart.If one goes there when it is way too hot, it is difficult to enjoy, I admit, but even that time can be magical if you just know when to go out and when to rest...Thank you Phil! 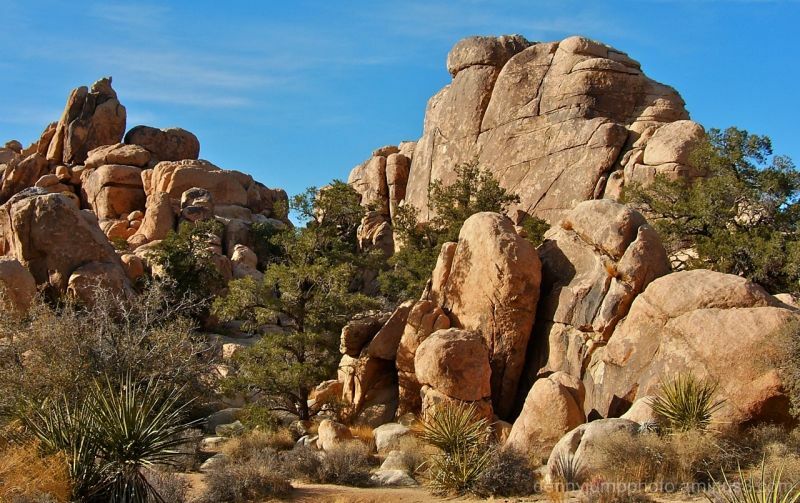 When folks say that Joshua Tree is boring, they have not seen these images. You are making this park come alive with color and beauty. Thank you for sharing! We are definitely taking a little trip there this winter when it’s time to snowbird from the north to the south. @Marie LC: Hi Marie - Thank you so much. I am glad that youare enjoyng this seires. My primary reason for doing these kind of series is to allow folks a chance to see things that they may never get to visit in person! ALl the best! @Tamara: Hi Tamara - thank you so much. If you ever go to LA sometime, try to convince a friend to take you out there (as long if it is not too hot..a frist visit here should always be in the more moderate months so that one can truly see and open their eyes and heart to this place. I wish you all the best good buddy!! @Mariana Maodush: No he parachuted down with a desert bunny :-) You are VERY observant Mariana....that's why your photographs are so compelling, fascinating and downright wonderful!! Thanks dear friend! This wonderful shot shows the textures and tones of the boulders so well. The light is wonderful and its great that your reference the yucca as well. Desert plants are so special LIving in the southwest for so long, these shots are dear to me. @Bettina: I totally agree Bettina...The desert is so very special.I guess it is also special becasue it is so mistreated by various entities , groups, mindsets, and attitudes. The desert lives in spite of, not because of humanity in most cases...too sad. Thank you so much for all of your wonderful comments on my photos...I truly cherish looking at yours and chatting back and forth with you..you are so special! Thanks Bettina!! @Larry Elkins: Hey Larry - Thank you very much sir. Your work is so awesome, I will definitely take this as an approval for sure. Thanks again! Those rocks are beautiful. I love that vegetation, too. @Steve Rice: Hi Steve - Thank you so much! We love this Park and we miss it alot!! Who says Joshua Tree is boring?! This place is awesome! I am so impressed by how you have composed these images and the narrations have been very interesting. WOW! Beautiful color tones and textures of these rocks! What a place and you have captured this beautifully! Well done Denny! So many rocks with so many cracks; it almost looks like there are a bit unstable. Another beautiful composition with a great sky. There are so many wonderful places to hide here. I can image living among these rocks -( might get a little hot and cold out there : ) ) - but what a wonderful place to reflect on life. Another beautiful image - of this brilliant display of nature. @Becky: Hi Becky - Thank you so much! Yes I would not advise going there in July unless you need some serious heat. It may look busy, but ahh so cool! Once again the lighting really stands out! @Julie: HI Julie - Thanks so much! Beautiful shot. Love these rocks, and you capture them perfectly. This has been a wonderful series!